When you think about traveling to Europe, you think of the major cities like Paris or Rome or Barcelona or Prague. You rarely hear about going out of your way to travel to Berlin. At least that's what I thought. But given various factors that made it almost idiotic of me not to say yes to this trip, I found an unexpected home in the city of Berlin, Germany. Berlin has a spirited city charm. You won't find overwhelming landscapes and photographic sceneries among its cooler and muted color palette, but what you will find are the subtle details hidden throughout the city that makes it a place of its own. It's the kind of place where you simply breathe in the livelihood--sights, sounds, tastes--to experience its natural energy. 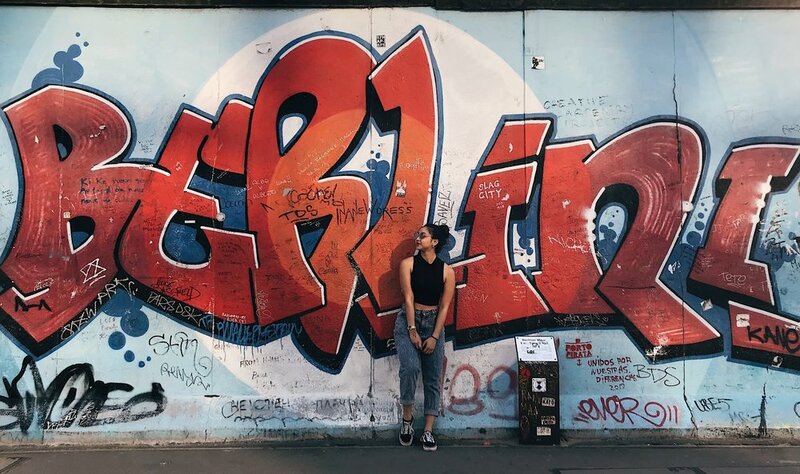 And because it's all about finding the little things of Berlin, I'm sharing my own trip as soft suggestions for a city that simply thrives on its own. If you're looking for an authentic German meal, this is the restaurant to go to. And by authentic I mean be prepared for tons of pasta, potatoes, and meat (and also come hungry because they give huge portions!) The aesthetic of the restaurant itself definitely reflects an Old German pub with its dark woods and low lighting so you'll feel like you've stepped back in time. Instagrammers, this is your spot. If you haven't seen the photos of this restaurant already, you're going to want to add this to the grid. 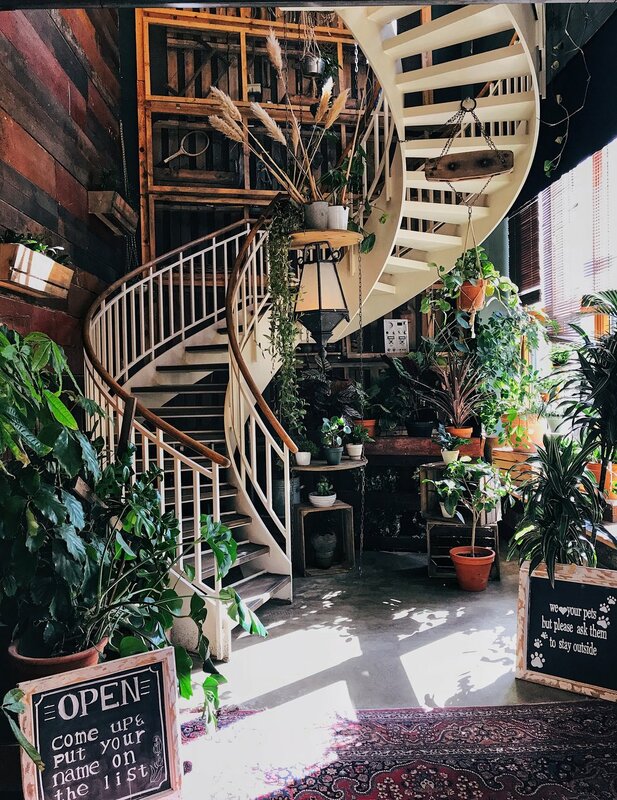 As soon as you walk in, you are greeted with the perfect photo op of a spiraling staircase adorned with green plants everywhere. Also, fun fact: the owners opened one in Brooklyn, too! If you ask anyone what is the one thing to eat from Berlin, it's Döner Kebabs. It's the Halal Guys of Berlin and you'll find them at almost every corner of the streets. So do yourself a favor and grab one as a snack or some late night munching. A small, cozy, wine bar that serves “Bavarian Tapas”. It's a quaint, jazzier spot in an isolated corner of the urban area. We had a little bit of everything since they are all small plates and definitely sharable. Plus, they brew their own beer! A former pharmacy turned coffeeshop, Ora is an aesthetically-designed hybrid of old medicinal world and modern-day coffee culture. As the advent coffeeshop goer, I had to check this place out for myself after I've seen so many beautiful photos of this place. It's the perfect afternoon snack and caffeine pick-me-up, but of course, do expect a little pricier bill given the upscale-ness of the place. A truly hidden speakeasy cocktail bar inspired by the author and playwright Samuel Beckett. I highly recommend this spot for some nice nightcap drinks. If you are an avid museum-goer like me, this is the area to spend an entire morning to afternoon. With five (yes five!) different museums to explore, you'll want to make sure your day plans are vacant, especially since each one offers its own collection of art and history, providing specific perspectives of Berlin's culture. Street art fairs - we came across so many street fairs and markets during our trip. Maybe it's because it was spring and the weather was consistently beautiful, but if you come across them, check them out! It's worth seeing handmade crafts and local art. And they make the best souvenir gifts. Grab a beer, find a seat, and drink by the Spree River near Museum Island, while listening to street performers. It's the perfect afternoon activity under the beautiful sunshine and you'll fit right in with the locals. Open every Sunday, this flea market is possibly the biggest one I've ever been to. With endless rows of vendors selling everything from vintage clothing to antique trinkets to handmade artwork, Mauerpark Flea Market is a must-do if you want to experience a casual Berliner's daily life. Not to mention the public karaoke-ing and of course, food trucks, that makes this the perfect Sunday morning activity. I highly recommend checking the famous gate during golden hour. Even though you'll probably be fighting for the perfect photo op with the rest of the tourists, you'll still feel the historic magic of the monumental architecture. A historic building that houses the German Parliament. 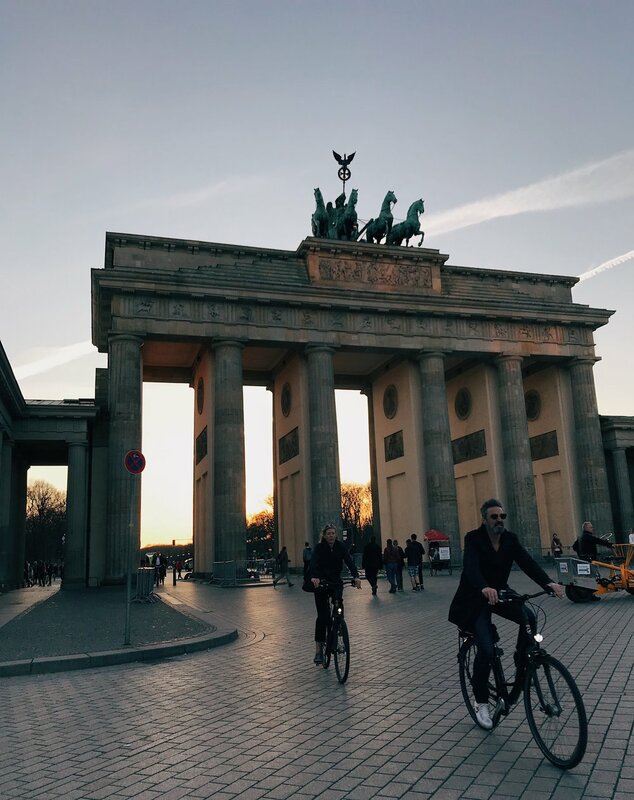 We made our way to this site right after catching golden hour at Brandenburg Gate and it stood immensely glorious against the setting sun. 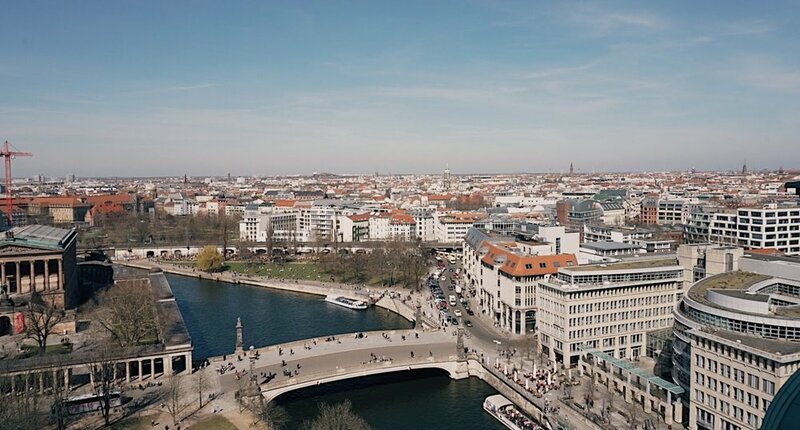 Only a few minutes away from Reichstag and Brandenburg Gate, Postdamer Platz is considered the center of Berlin and a public square of shops, restuarants, and entertainment. Don't think I need to do much convincing as to why this is a definite must-visit on your Berlin trip. Everyone takes in the experience differently but I know I speak for everyone when I say that you can feel the haunting past chilling down your skin as you walk through the memorial. This is an important piece of history you absolutely don't want to miss. It's a remnant of the Berlin Wall and painted with series of murals by various artists. On one side is the murals paralleling the street all the way down and on the other is the river, where we sat along the steps and bathed in the breezy weather and sounds of outdoor performers. Berliners just don't sleep! They seriously know how to dance all night, and by all night, I mean until 6 in the morning. Unfortunately, my grandma-status couldn't keep up with the bustling energy but we did check out one club that had five different rooms, each with its own themed music (90s, alternative rock, hip hop, etc.). And for the 3 hours we were there, aka what's considered brief time in European nightlife, we still had a lot of fun! As I said earlier, these are just my experiences in Berlin, but of course, there are plenty to do, see, and eat that I probably missed. No matter what, I can ensure you that you'll still have a fulfilling and memorable trip because there is really no wrong decision to make. Just take it all in and you'll understand Berlin's magic.